As a small business owner, your goal is to promote your business and gain new customers or clients. To do so, you have to build a customer base through advertising. While there are many ways to advertise and publicize your company name to the community, try using your own creativity to produce a book. Writing a book can help you reach an audience you otherwise would not have influenced, and can be an effective way to promote your brand. In an age ruled by digital media, writing a book to promote your business can help you connect with your customers and clients in a more intimate fashion. It allows you to share the wealth of knowledge you have attained. Initially, your target audience may be the only ones reading your book, but with the right topic, it may draw others who are looking for your specific type of content. The first step, and arguably the most important one, is choosing a topic. With endless possibilities, it may be a daunting task to narrow down your ideas to just one, or perhaps a few on which to focus. To ensure your book’s success, you want to choose an ideal topic that is marketable and represents your business well. Readers want to be engaged and informed at the same time. Your topic should be something that can gain the reader’s interest while giving them information about the purpose and goals of your business. With just a bit of research, you can figure out how to choose a topic that will appeal to your audience. At the end of the day, your name will be associated with the topic you choose and will help shape your business, so researching your topic is important. How Should I Choose a Topic for My Book? The first place you may want to begin book topic research is with yourself. Is there something you have a wealth of knowledge about that may be beneficial to your customers or clients? Brainstorm things in which you are most knowledgeable. 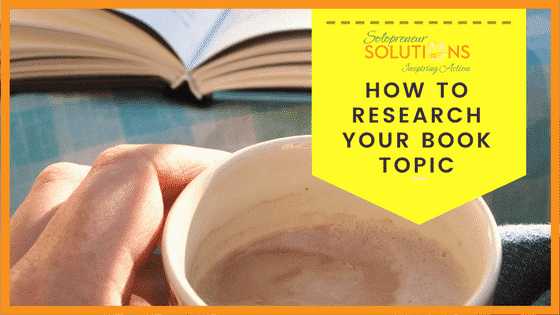 A list of topics you are most familiar with or consider yourself an expert on can help you jumpstart the process of researching your topic. If you know a great deal about a subject, you probably careabout that subject a great deal as well. While it is important to write what you know, it is also important to write what you feel. If you are passionate about your book topic, it will be evident in your writing. Keep in mind the audience to whom your book will be directed. If you’re unsure of your target audience, search websites like American Factfinder or the U.S. Census online to find demographics. Make a list of services or products your business provides and how it would benefit your customer. With demographics like age, gender, or location in mind, decide what specific type of customer could benefit most from your business. Once you’re aware of the audience you’re aiming to reach, look into the trends for that particular audience. Find out what is popular by taking note of things you are surrounded with in your daily life. News channels, newspapers, ads, and social media can all tell you the top issues going on currently and what subjects are popular. It can be as simple as searching ‘what’s trending’ on Google. Using a subject that is popular with the audience you’re trying to reach will help you influence as many people as possible. Utilize online shopping websites such as Amazon to search for books which may fall underneath the same category as yours. Note which ones are on the bestseller list and maybe even read some of them. Paying attention to the trends a certain range of demographics follow may help you to understand what your target audience is looking to find. Pay attention to customer feedback on books that would be similar to yours. Where is a Gap in the Market? Now you have identified your target audience, and you are aware of popular topics within it. Search for a gap in the market. Is there something you can offer that is not prominent in the market now? Is there something you can adapt and improve on to bring your audience something new? Choosing a diverse topic can drive more people to your book if they are looking for a fresh source of information. Use niche marketing to help you understand how to develop your topic. Niche marketing is a small subset within a market that is profitable. You should be familiar with your competition to use this strategy. Know who business competitors are targeting and how they are reaching their customer base. Identify something within that market you can give customers more of – don’t copy your competitors. Do you have experience choosing and researching a book topic to promote your business? Share your advice with our readers!